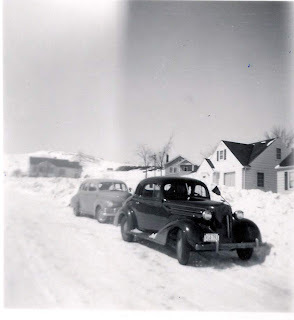 Here's the snow in West Duluth in front of Grandma Mary's house (right hand side - black roof) - well before I was born. Grandma Mary (really MaryAnn to everyone else) lived in this house from the early 1940's until the early 1990's. Roughly 50 years. She redid the Kitchen at least twice while I was alive and had the same french provincial furniture that she simply recovered. She was "green" back then but that's because she lived through the depression as a teenager! Her house was a tiny 2 bedrooms with 1 larger bathroom and a full basement and partial attic. She had pictures of her Parents C. Oscar and Nellie Krantz in the hallway but they used to scare me with their unsmiling black and white photos. Grandma had to assure me over and over that there were nice and loving people - she'd get a little cross with me if I bolted by the pictures too quickly. I don't remember Grandma's sister Auntie Alice but I do remember how much Grandma loved her. I do remember Grandma's half brother Uncle Andy Krantz. Andy ran a dairy and chicken farm in Northern Minnesota...he always let me feed the calves. Andy was C. Oscar Krantz's first son with his Miss Christenson - she died in childbirth with Andy Krantz and Nellie Workman was his second wife. Andy went to live with Miss Christenson's parents - older people in their late 50's and early 60's. Why didn't Nellie and Oscar take him? Grandma Mary always felt soooo bad about that. Andy married and ran his farm with 2 adopted sons and was well loved by his family, Grandma Mary and our Dad, Gary. Gary especially loved Andy and vice versa. We Woodward women do not believe in breaking up families - that behavior stops here and I will have a long, hard talk with Nellie Workman in the hereafter when my time comes (in about 50 years or so - I am in no hurry! ).